Pieter van den Keere (also known by the latin version of his name Petrus Kaerius celavit which appears in the upper left of the map) was an immensely skilled and prolific Dutch engraver whose early work included a set of miniature map plates based mainly on Saxton’s earlier maps. Van den Keere engraved these from 1599 onwards, including maps of Scotland and Ireland. Had he decided to publish them in atlas form he would have been the first person to complete an atlas of the British Isles — an honour that fell to John Speed. A later publisher, George Humble, reissued Speed’s atlas in 162.7, 1632. and 1646. To coincide with each of these editions, he reprinted Van den Keere’s plates, also in atlas form, referring to them as ‘miniature Speeds’ and using Speed’s popularity to encourage their sales. He re-worked the plates (acquired from Joan Blaeu, who had first published them in atlas form in 1617), converting the Latin county titles into English. 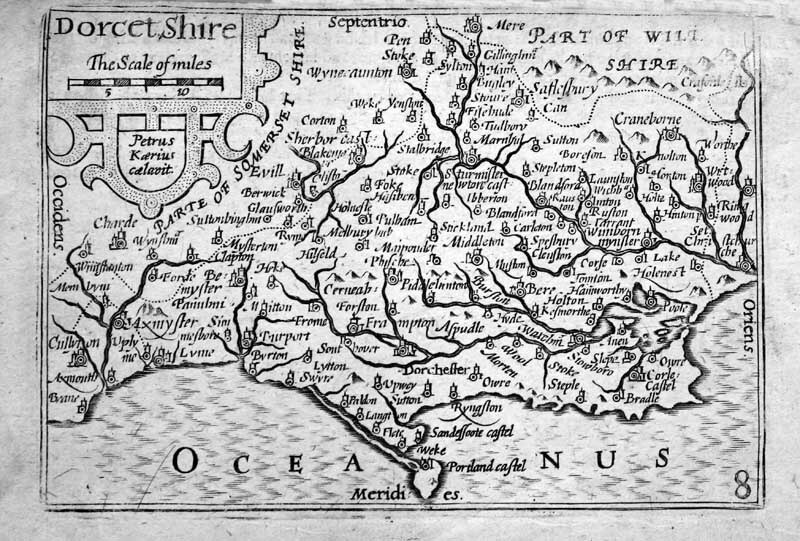 He also printed an English text on the back (not available here) and gave each map a plate number in the lower right hand corner which is 8 for Dorset. The map is liberally dotted with towns and villages (although Charmouth is not included) and is a masterpiece of cartography in miniature, the map measuring 12 x 8.5 cms (5 x 3.5 ins).